Dots to Die 2.0 is modified version of a classic with an oddly logical ending which finally brings a sense of closure to the routine. The modified version will enable you to perform the trick effortlessly. 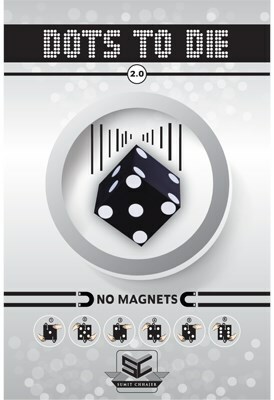 There are no magnets, no extra dots to attach or detach. The working principle will allow you to perform with confidence. A flat square with 1 dot at one side and 5 at another side, when turned changes to 2 and 4 dots respectively. Finally they change to 3 and 6 dots. Further toss the flat square in mid-air, instantly it changes to a Jumbo Dice.